There is nothing in sports quite like a comeback. It’s almost a natural instinct to root for the underdog – the proverbial “Cinderella Story” – because even on a basic level you want to watch something exhilarating rather than one team routing the other. It’s all about the barn burners. And what happened on Sunday was simply the greatest comeback in sports history. Even over the last few years, there have been some unprecedented comebacks in sports. Three years ago, Tom Brady led his New England Patriots back from a 28-3 deficit with a few minutes to go in the 3rd quarter against the Atlanta Falcons in order to win the Super Bowl. Several months later, LeBron James stormed his Cleveland Cavaliers back from a 3-1 game deficit against the Golden State Warriors to win the series, which had never been done before. Months later in November, the Chicago Cubs were also down 3-1 games ironically against the Cleveland Indians and you can probably guess what happened. But then we were blessed with a story of redemption and resilience over the weekend. 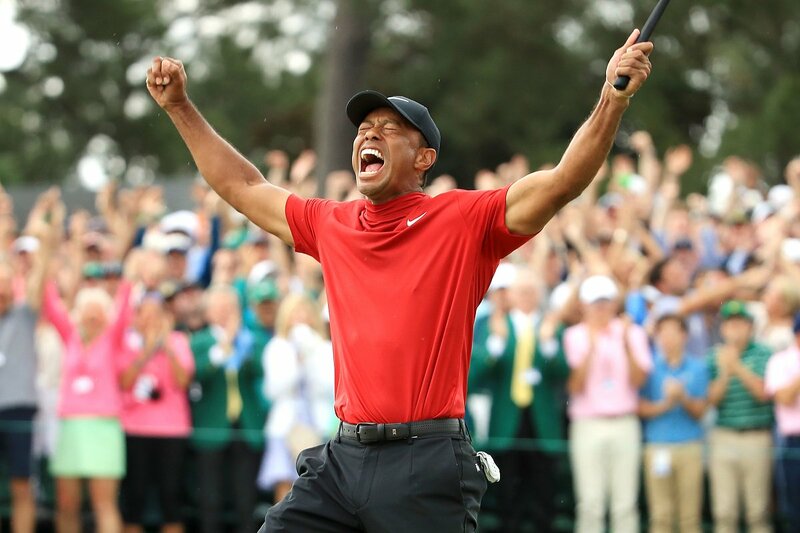 Tiger Woods claimed his fifth Masters title on Sunday in what most golfers consider to be the hardest golf course in the world at Augusta National in Georgia. Woods had not won a Majors Championship in nearly eleven years until Sunday. The balding 43-year-old screamed with excitement as he sank an 18-inch putt. The one tidbit about Woods’ career that’s interesting is he’s never came from behind to win a Majors. He was tied for second place on Sunday morning, two strokes behind the leader, Italian Francesco Molinari. It was basically par for the course for the first eleven holes but then things took a dramatic turn on the tenth when Molinari and Finau both sunk their balls in the water causing them to double bogey. Suddenly, Woods was in the lead. But that’s not why it was one of the greatest comebacks in the history of sports. It wasn’t that Woods had never come from behind to win a Major. No, it’s because of the road of adversity he faced in those eleven years since he last won a Major – albeit, some of that road was self-inflicted. Woods’ life began to unravel on a fateful Thanksgiving night in 2009 when he and his wife made national headlines over a domestic dispute between the two when she allegedly found out that he had been cheating on her. The experience painted Woods in a dim light and ultimately led to a divorce. After that, it was nothing but surgery after surgery that prevented him from playing. If it wasn’t his back, it was his leg, which also led to a serious addiction to painkillers and he was arrested in August 2017 where toxicology revealed he had five different drugs in his system. As he recovered from his addiction, Woods became healthier in dealing with his injuries as well. However, most critics and analysts doubted that he would ever win another Major, let alone The Masters in Augusta. Last year, he came close to winning a couple of Majors but the level of talent on the golf course was just too much for the aging star. That aging star showed all of his critics and doubters on Sunday though. He played against the toughest golfers in the world and redeemed his status in an incredible way. It was the next generation of players who were visibly shaken by the crowd’s cheering for Tiger Woods. It was a classic case of a once-meteoric rise to stardom came crashing down abruptly, but he wouldn’t let that define him. He’s Tiger Woods, y’all.